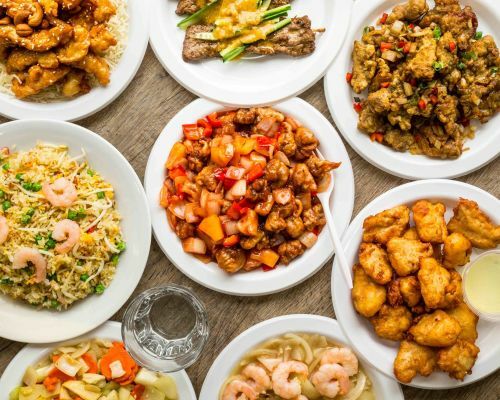 Menulog delivers for Mei Sun Chinese so you'll be able to track your courier on a map. Large special fried rice, beef in black bean sauce, sweet and sour pork, lemon chicken and prawn crackers. Large special fried rice, sweet and sour pork, pork spare ribs in plum sauce, combination chop suey and prawn crackers. Large special fried rice, beef vegetables, honey chicken with cashew nuts, pork spare ribs in plum sauce and prawn crackers. Traditional spicy Chinese soup with choice of protein, bamboo shoot slice, bean sprout, sliced potato and vermicelli. Caution: really hot! Choice of protein with steamed rice. Spicy and stir fried with chicken, peanuts, vegetables and chilli peppers. Chicken, small prawns, peas and egg. Satay beef or chicken on skewer and contains peanuts. Two dim sims, two spring rolls and two prawn fritters. Three pieces. Prawns wrapped in a crispy potato strip.